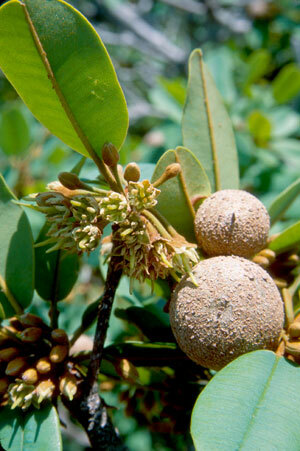 General Landscape Uses: Specimen tree or shrub in the Florida Keys. Buffer plantings. Ecological Restoration Notes: A fairly common element of the upland side of the ecotone between tidal swamps and rockland hammocks in the Florida Keys. Rare elsewhere. Description: Small to medium tree or large shrub with a dense rounded crown. 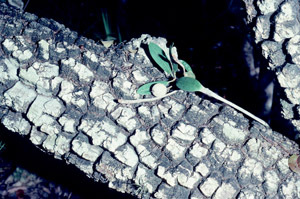 Trunks usually short, gnarled to 18 inches in diameter, but usually much less in South Florida. Bark gray to reddish-brown, deeply fissured and breaking into small plates. Leaves think, leathery, clustered toward the ends of the twigs. Dimensions: Typically 10-15 feet in height; to 21 feet in South Florida. Usually as broad as tall or broader. Range: Monroe County Keys, Miami-Dade and Collier counties; Bahamas. 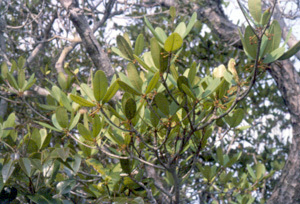 In Miami-Dade County, native to islands in and around Elliott Key in Biscayne National Park and the extreme southern mainland along the shores of Florida Bay in Everglades National Park; collected once in Collier County by J.R. Lorenz in what is now the Cape Romano - Ten Thousand Islands Aquatic Preserve. For a digitized image of Elbert Little's Florida range map, visit the Exploring Florida website. Habitats: Coastal hammocks and pine rocklands. Soils: Moist to rarely inundated, well-drained to moderately well-drained limestone soils, with humusy top layer. Fruit: Light brown berry. Edible. Comments: Related to the commercially grown sapodilla (Manilkara zapota). It is listed as threatened by the state of Florida.